This text is super approachable, and I find that really commendable. The chapters are short, usually around two pages. They are basically little nuggets of philosophy, interwoven with information and ideas from historical American figures. I must say – the author doesn’t cite anything when he writes of historical people and facts, and it was giving me information profession anxiety. If you can look past this, these passages are informative and interesting (but it’s not verifiable! aaaaah). Ahem. Unlike other philosophical texts I’ve read, this one can be done in one sitting and leaves you with some new and interesting ideas. There is a definite thematic arc, with the text moving kind of outwards into bigger, more grandiose ideas about what is America. It also evoked other American writers – the two I found myself thinking of were Ginsberg and Whitman. Ginsberg was present in the way Hilgendorf would sometimes cram strings of ideas into one sentence, and the first chapter decrying the present state of the American Dream seemed to be an homage to “Howl.” And Whitman’s “Song of Myself” infuses the text with these egalitarian ideas about being multiple (if not infinite) people, and what America can and does mean. Though that’s not to say I was sold on the idea of America in this book. 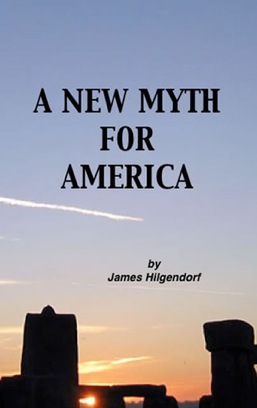 I think Hilgendorf presents an ultimately positive and hopeful approach to thinking about America as a symbol and what it could one day be if we allowed ourselves to make it happen. I found this approach far different from my own life philosophy (I’m more reliant on exploring the context rather than focusing on each as an individual) but it was still thoroughly readable. I can respectfully disagree with portions of this philosophy, just as the author very respectfully writes them. It felt so American! There were some problematic elements. One of the weaknesses of the book was – while the ideas were cool and uplifting – there wasn’t much unpacking of the concepts. The most glaring example of this was the chapter “Women.” It’s literally one sentence that says there is no room in the new world for institutions that degrade women or don’t foster parity between genders. Yo, I am all for this (obvi). But that’s soooo easy to write in a book. It’s as easy as writing “and fat-free yet delicious cupcakes rained from the sky, and all ate without worry or sadness.” Like.. doesn’t make it happen. So that lack of practicality really stuck out at points. Also, I don’t want to be the privilege police, but it’s always harder to take a man writing something simplistic about power structures and women. It’s something women deal with every single day, making that sentence really kind of offensive to me. I don’t for one second believe he meant to offend, but I still took issue with it. I also wished some of the bigger ideas were grounded. There were some nice anecdotes that tied the more abstract beliefs to concrete experiences, but I really wanted more of those. And don’t get me wrong – I really love big, sweeping portraits of America. Bruce Springsteen is in perpetual play in my life, and I fell in love with Whitman’s bold poetry while I was in high school. This text felt almost too impersonal at points, making it harder to relate to. This book could be a great selection for those not accustomed to thinking about their place in the universe, but I wanted more substance. Y’all know I spend about 70% of the time contemplating angsty LIFE things, so this left me feeling less intellectually stimulated than I wanted. It could function as a great conversation starter but not enough for me to sink my existential little teeth into by myself. For that reason, it could be a really interesting selection for a book club. I’m sure people would have strong feelings about this, and it could open up new avenues of discussion. -No citations, says the librarian!